Welcome to Issue 59 of the SHAPE Journal, a loose collection of papers centred around the new notion of “meta forces”. The problems addressed by this theorist are many and varied, all arising primarily out of the inadequacies and contradictions which have arisen as consequences of the now dominant Copenhagen Interpretation of Quantum Theory. But, in addition, the problems are also due to much longer-standing compromises and alternative stances, that have plagued Science, and existed for millennia. So, let us start with the problem of communications throughout vast regions of totally “Empty Space”, and fields of truly colossal size existing within there too. Now, the reasons why such anomaly have been accepted as O.K. in spite of the inability to detect any sort of means for supporting such features, is simply because the Formal Equations describing such phenomena seem to work very well. First, the fact that we cannot explain why things occur as they do is ignored, because we have those useful equations. And, second, it is because Modern Science has finally switched to the totally idealist position that assumes formal relations actually drive concrete Reality. Such an idealist/pragmatist stance is anathema to this physicist, and led to an attack upon that position, via a purely physical attempt to explain the whole range of phenomena abandoned by this approach. Effectively, it was soon clear that the task had to be a wholesale assault upon the Copenhagen stance, at the very heart of which, were the conclusions drawn from that cornerstone of the Theory - the Double Slit Experiments! Now, as it turned out, every single one the anomalies of that set of Experiments, could all be totally removed, solely by the presence of a currently undetectable Universal Substrate, acting as an intermediary, and providing the Waves, while the missiles aimed at the Slits, actually provided the Particles. The only conclusion one could draw from that success, was that such a Substrate must indeed exist, and, this theorist began the task of defining appropriate Substrate Units to deliver all the involved phenomena. The research was primarily determined by the essential undetectability of such a Substrate, and inexorably led to the idea of the units being entirely composed of mutually-orbiting-pairs of Leptons - especially chosen to deliver all the phenomena when active, but to be totally undetectable when inactive (see above). But the substrate for Gravitation Fields was with Gravitons; and this proved to be the most difficult of all! The overall ambition was to explain everything via this multi-layered and undetectable Substrate, and it was finally achieved by assuming a Meta-Gravity Dipole Effect in Gravitons, similar to the Magnetic Dipole Effect in Magnetons. 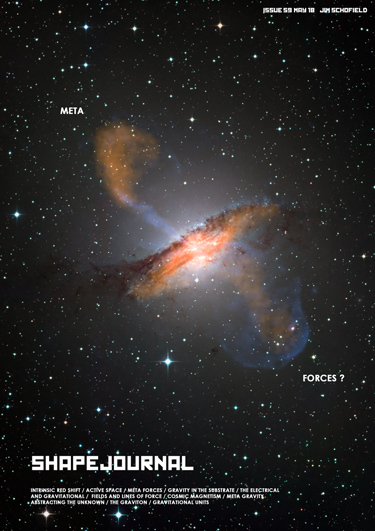 But what could this new meta force mean for physics - and how could we possibly detect it?